Hey now! For as long as I can remember, I’ve seen carloads of my friends schlepping out of state – or waaay upstate – every summer, about once a month, in pursuit of music festivals with funny names. It made me wonder why they should have to travel so far, when Long Island is home to so many world class musicians and bands. The Island does have a tradition of great music festivals, but it occurred to me that we can use more – LOTS more! Hence my summer mission to present funny named festivals locally, about once a month, with varying themes, showcasing the region’s most-loved bands, hosted at scenic outdoor venues; adding to the mix Live Painting by dozens of artists, and low cost (or free) admission – with minimal schlepping required. And during the cooler months, the festivities continue at indoor venues across Long Island. Catch you out on the scene! As of 2017 Rich has produced a total of 42 not-for-profit/benefit festivals, and hundreds of ongoing indoor events, including Live Art Fusion, ArtMOSPHERE, Northport After Dark, Art Cafe, Grateful Jam, and Live at The Kahuna series. His annual multi-themed Summer Arts Festival Series is hosted at several well known outdoor venues, and features legions of artists painting to the music of Long Island’s favorite bands. 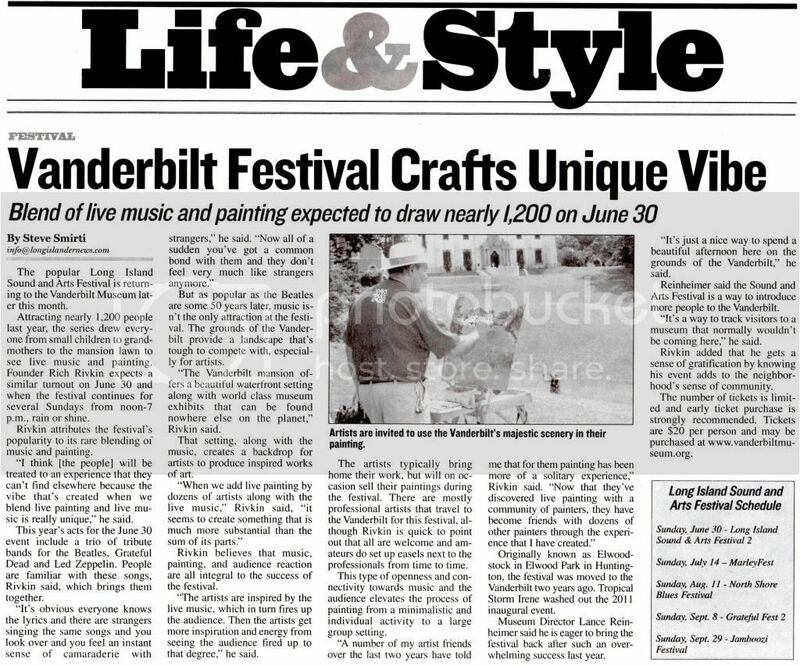 Rich writes an Arts/Music column in the Village Connection Magazine, and is also a member of the Advisory Board at Arts Alive Long Island, and committee member at The Art League of Long Island, as well as Meetup Organizer of Long Island Professionals. In 2013 Rich received Outstanding Advocate for The Arts Award from the Long Island Arts Council at Freeport. Rich has been band leader and percussionist in multiple projects since 2001. During daylight hours, as president of Aaron Environmental Group, Inc. Rich is engaged in the business of moving mountains (of contaminated soil). Another wonderful day of great music, congenial company, beautiful scenery and the shared enjoyment of interesting art and picnic fare. I’m never less than impressed by the caliber of the talent that Rich Rivkin attracts to perform at the festivals he stages and the Woodstock was no exception. Half Step channeled the spirit of mid-70’s Dead, while Milagro nailed Santana’s Soul Sacrifice and every other song they performed. Wondrous Stories continues to surprise with a varied repertoire, (yesterday’s Who set was a revelation), and talent to burn. The Jelly Band, meanwhile, acquitted themselves beautifully as well, delivering faithful interpretations of songs peformed by The Band, Joe Cocker and many others. Loved this show! Great music, phenomenal venue, very well managed. I attended this concert with my early 20’s sons and we all very much enjoyed this concert. We particularly liked Milagros and Half Step. I have been to several events produced by Rich Rivkin Presents and have never been dissapointed…Rich really knows how to put on a great show!